The past few weeks have been very full: full of loveliness, busyness, uncertainty, eventfulness… and no lack of baking. First, there was the wedding of a longtime friend of mine, Julie. Several years ago when I got married, Julie shot all of my wedding photographs and gave them to me as a gift — film, processing, and all. My photo album has perpetually reminded me of her friendship and generosity, and her recent nuptials were a chance for me to finally repay the gift. So I made several dozen cupcakes for her wedding guests (half chocolate-orange, half hazelnut), and cupcakes have been on my mind ever since. Then my husband and I took a few days off for a road trip together. We had both been needing a break quite badly, and a low-key excursion was the perfect solution. We spent some time on the beach, shared a few wonderful meals, reunited with friends, and simply rested. On our way home, we stopped at a roadside fruit stand and bought a mountain of sweet, juicy cherries. Bursting with tangy flavor, they were an addictive snack: perfect for the ride home. 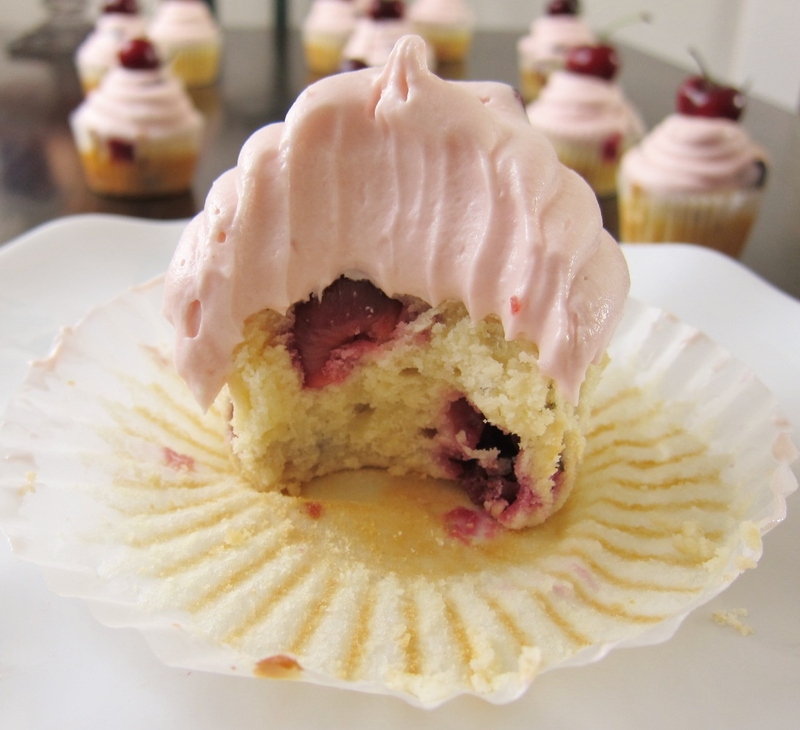 With more more than we could possibly eat in one sitting, the leftover cherries were destined for another cupcake creation. I wanted to highlight their freshness with something herbal or garden-like, and I knew they’d need a thick batter to stay afloat. So I decided to pair them with a bit of fresh rosemary in a creamy yogurt cake. The sprinkle of herbs alongside the morsels of fruit proved to be a delicious duo of flavors. Rinse all the cherries. Set aside 15 of the prettiest ones with stems intact. Remove pits and stems from the remaining cherries, then slice each one in half (or in thirds or quarters if cherries are large), making sure no pits are lingering. 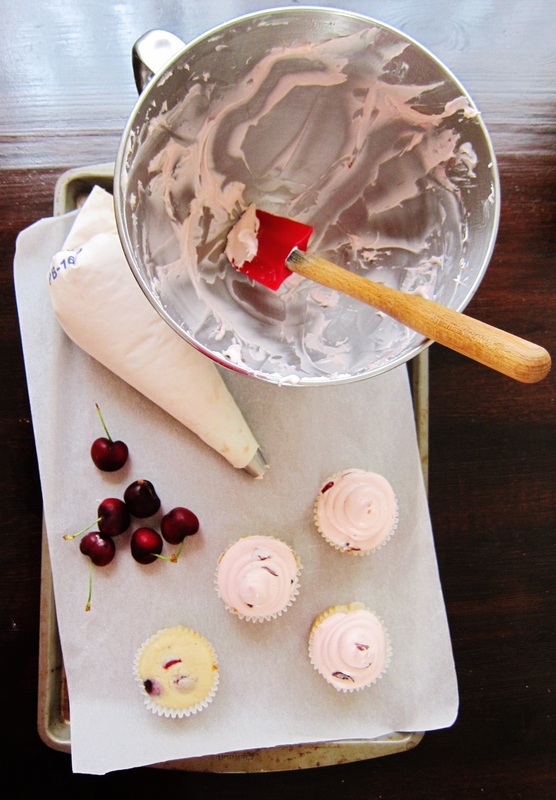 Measure out ½ cup sliced cherries and set aside for the frosting. 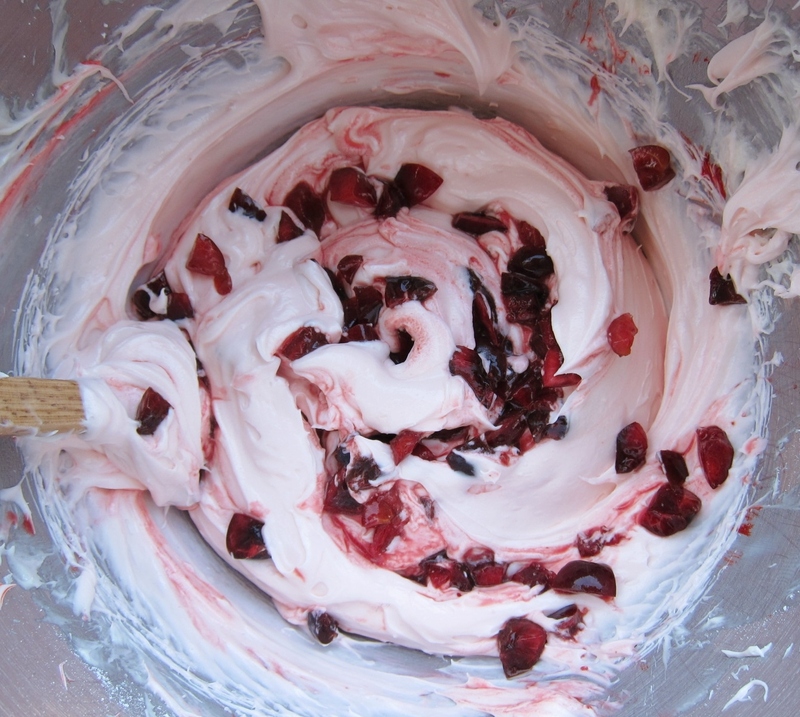 Set aside remaining sliced cherries for the cake batter. Preheat oven to 350 F. Line muffin pan with 15 paper liners. Beat butter and sugar in a large bowl until smooth and pale. Fully beat in the eggs one at a time, followed by the vanilla, then the yogurt. Mix until incorporated; don’t worry if the mixture looks a little lumpy at this point. Sift the flour, baking powder and salt over the egg mixture. Stir slowly — the mixture will be very thick — gradually adding the lemon juice. Beat well, stopping to scrape sides of bowl with a spatula often. When batter is smooth and even, fold in the minced rosemary until evenly dispersed. Gently fold in the sliced cherries. 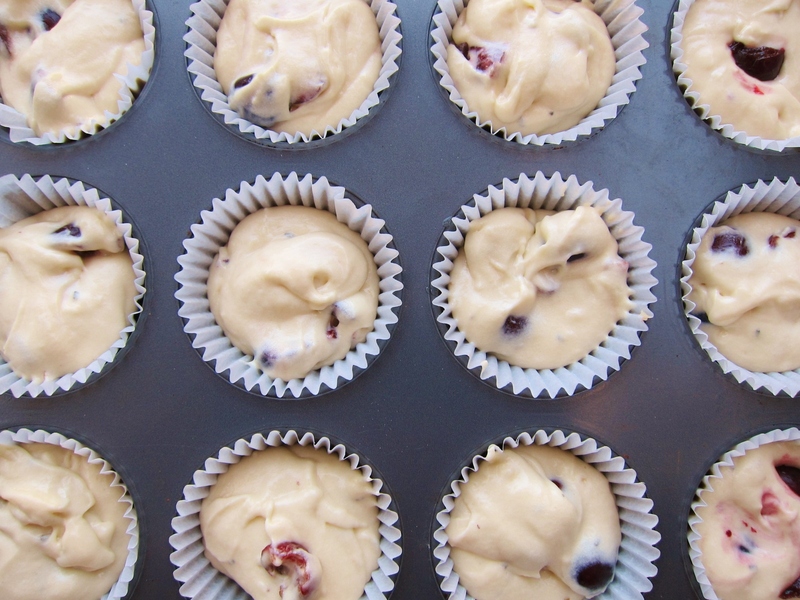 Scoop batter into lined muffin pan, filling each cup 2/3 to 3/4 full. Bake for 15-20 minutes. A toothpick should test free of wet batter and your kitchen should be filled with a delightful buttery aroma. The cupcakes will look pale from the top, but sides and bottoms will be toasty. Keep in pan for only a few minutes, then transfer to cooling racks or a towel on your countertop. Let cupcakes cool completely, then cover and store at room temperature up to 12 hours, or better yet, frost and serve just when cooled. Mince the sliced, pitted cherries so that each half cherry is cut into at least three pieces. Toss them with the tablespoon of lemon juice; set aside. Whip together the butter and cream cheese until smooth and even, scraping down the sides of the bowl with a spatula often. Beat in the vanilla. Sift the powdered sugar and salt over the bowl. Stir it in by hand, then whip on high for a few minutes, adding beet juice or food coloring if using (the cherries will naturally tint the icing just a bit). Fold in the minced cherries and lemon juice. Cover tightly and refrigerate for a few hours or overnight. 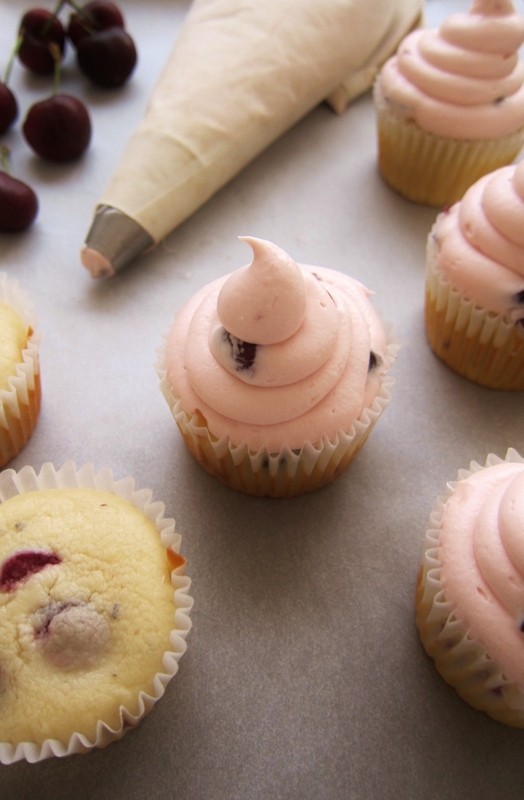 Pile the frosting onto the room temperature cupcakes. 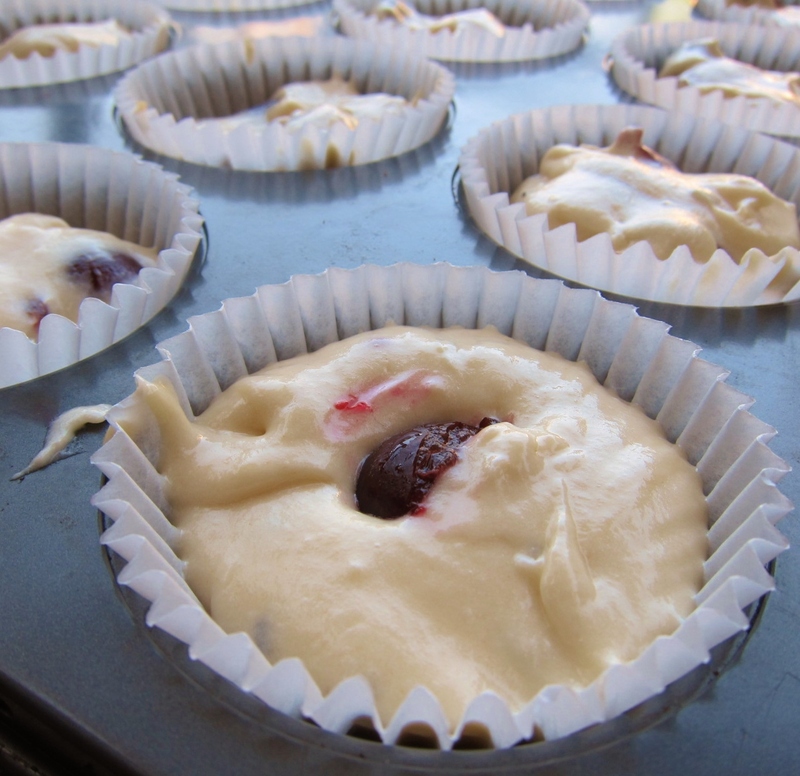 If using a pastry bag, make sure to use a tip with a large enough hole for the bits of cherries. 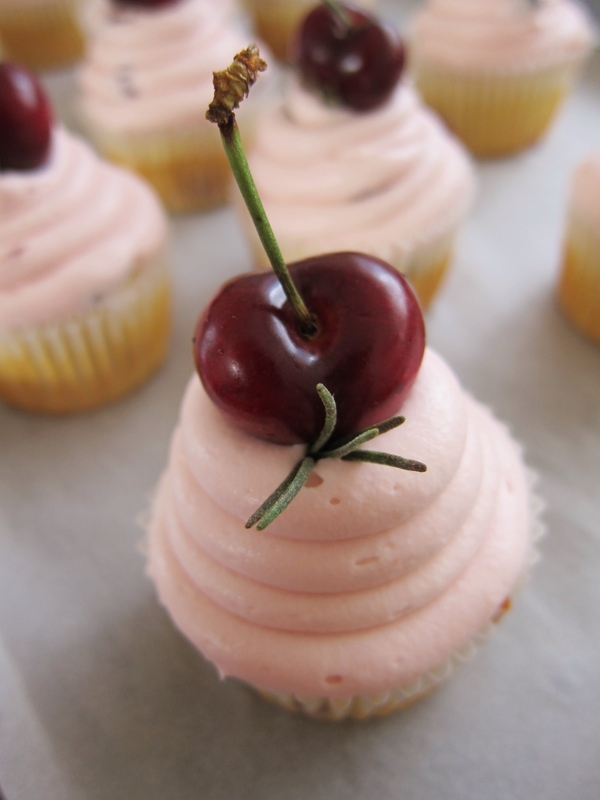 Top each cupcake with one of the whole cherries you reserved at the beginning of this recipe, and add a sprig of fresh rosemary if desired. 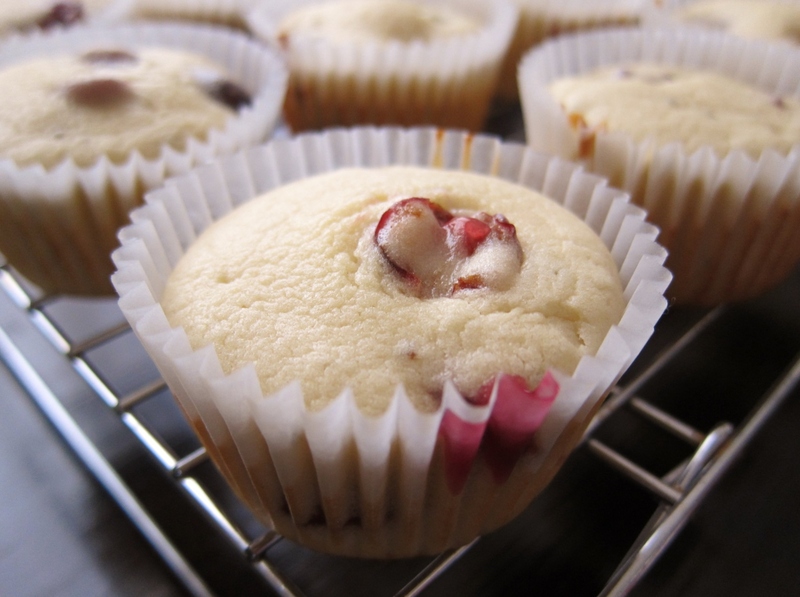 With their dense, moist crumb and their bits of juicy fruit, these cupcakes are a perfect way to celebrate cherry season. Their trace of rosemary offers a whisper of refreshment, while the yogurt and lemon delightfully complement the tart cherries within. Vivid, decadent and satisfying, each bite reminds me of the getaway that brought home the main ingredient, and the sweet celebration that inspired them. This is deeply delicious. *Maybe next time… If you don’t want to deal with chilling the frosting for so long in order to make it thicken, you can add an additional 2 to 4 cups powdered sugar to the cream cheese icing as many recipes do. This will create a stiffer and much sweeter icing. If you like the idea of having more lemon flavor, add the finely grated zest of at least two lemons, or a teaspoon of pure lemon oil. Alternatively, if you don’t have a lemon or lemon juice on hand, you can use milk in place of the juice. As a reminder, the thick batter needed to hold the cherries creates a dense cake that’s best at room temperature (it gets firmer with time and/or refrigeration); try to serve soon after baking if possible. 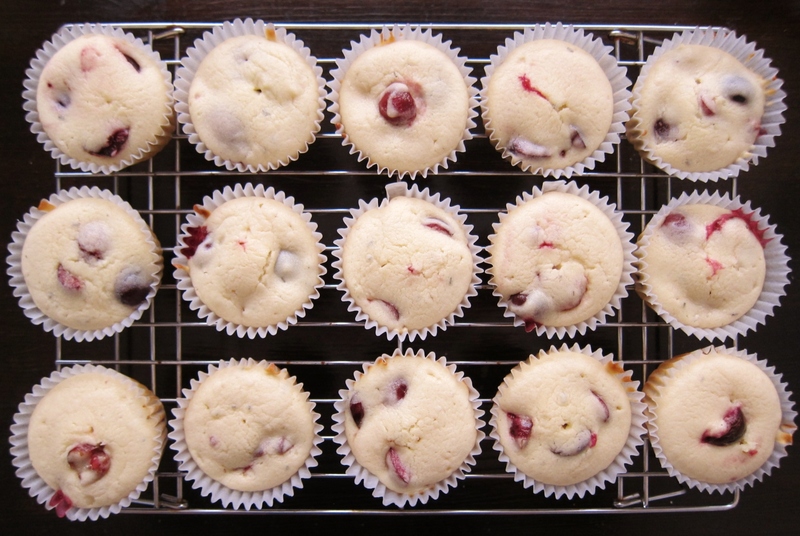 This entry was posted in Cakes & Cupcakes, Sweets and tagged baking recipe, baking with herbs, cherries, cherry cake, cupcakes, dessert, fresh cherry dessert, herbal, herbs, rosemary. Bookmark the permalink. 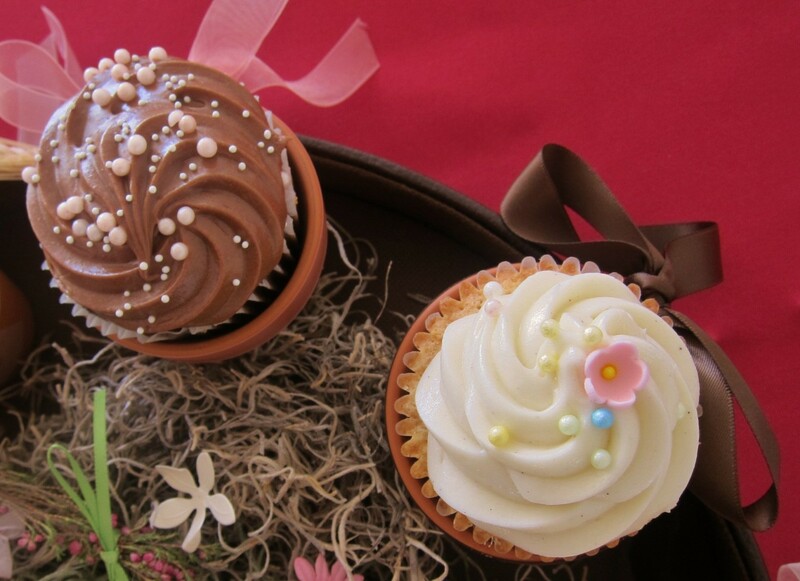 Thank you so much, dear HungryMum!� Your sweet creations always make my mouth water, so your kind words mean a lot to me. More creative Yummy stuff. Any leftovers?? Sorry, no leftovers, but maybe some cookies will halt your craving for the cupcakes? You have been busy but it’s nice to see that you still found some time to put those lovely cakes out there to tempt me. I also had a friend who took tons of pictures of our wedding & put together a beautiful album for us. I really love that album more than the professional photographer’s. It’s much more special when someone treats you to a personal gift like that. Thanks so much! If you splurge and make them, I hope you enjoy every bite! These look so delicious! I love cherries 🙂 I understand the wanting to share something sooner…I have been slackin’ myself. 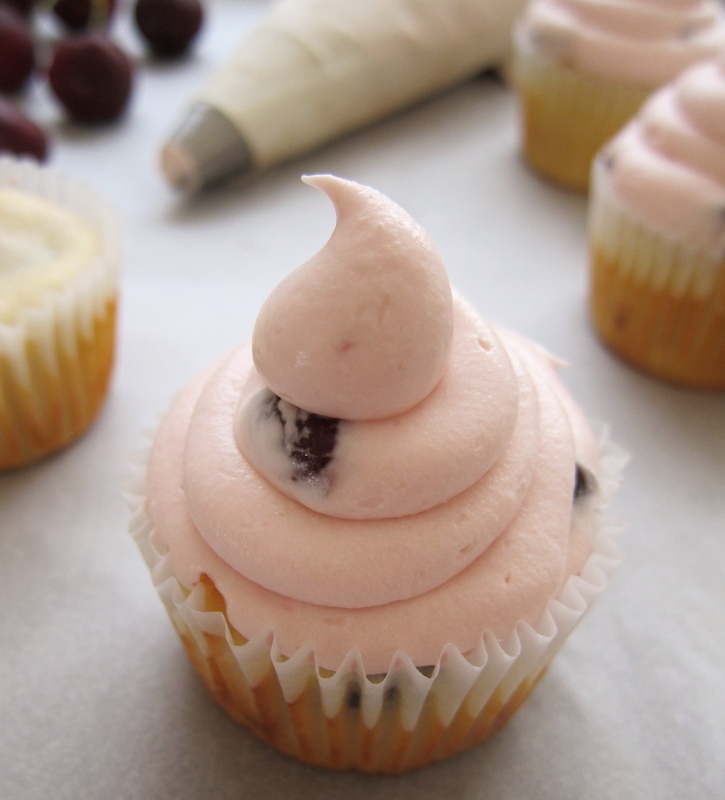 Delicious cupcake! Thank you, LillySue! 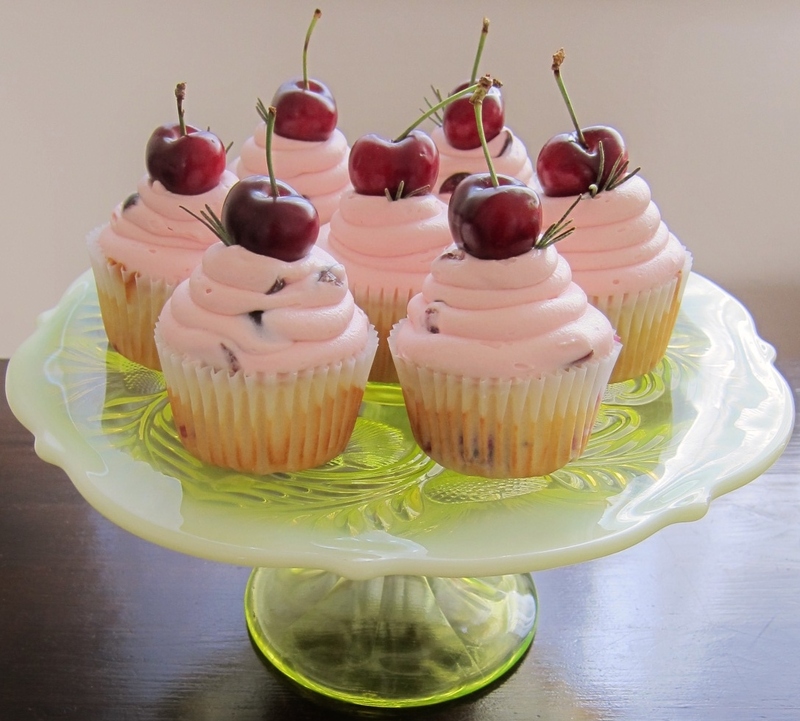 I love fresh cherries, too — in fact it was a little difficult to save some for this recipe. As for the busyness, I don’t think of it as slackin’ — just life getting in the way. And even though your blog is an amazing creative project we all enjoy and learn from, it makes me happy to know that you’re getting a little time away from the computer (at least, I hope you are!). We all need that sometimes! These look just amazing! Cold, sweet cherries are one of the things I most look forward to in the summer. What a beautiful idea to pair them with rosemary. So glad you two had a lovely getaway! Thanks so much, Cameron! I love cherries so much, too — they are really dessert in themselves… but it’s always hard for me not to celebrate something delicious by making into a(nother) dessert. I loved the trace of rosemary with the cherries, and I think you would, too! Your friend was VERY lucky to have you as her friend to make such beautiful wedding cupcakes for her wedding. 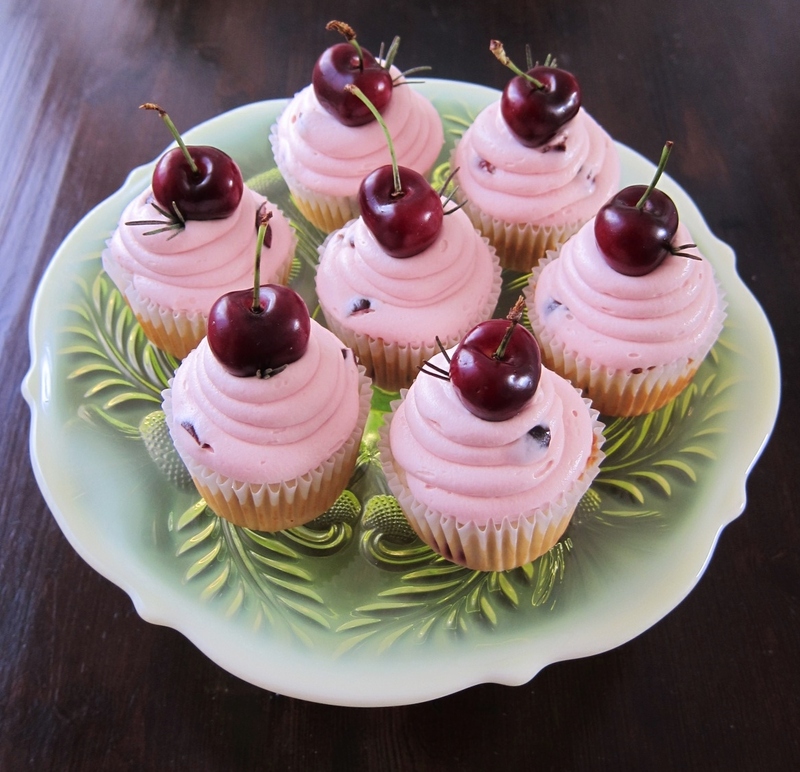 And these cherry cupcakes look just incredible as well. Such beautiful photos too! I am happy to hear that you have had such special and joyous occasions, such as your friend’s wedding, to savor and enjoy, and also happy to hear that you and yours got away for a much–needed bit of beauty, rest, and relaxation on a road trip together. Hearing about both of these things makes me very happy. 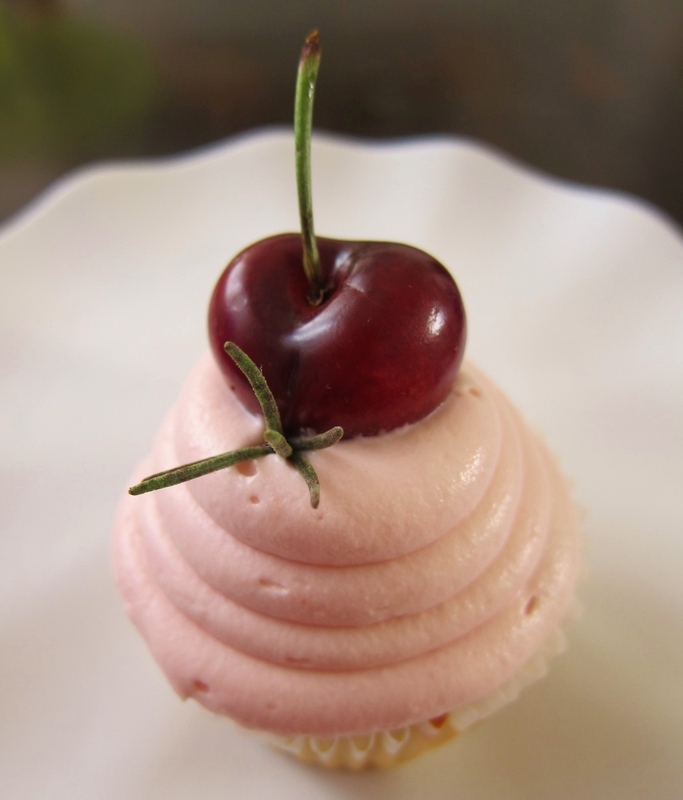 As I’m sure these cherry cupcakes made anyone who got to try one very happy as well. They look beautiful and delicious. As all your creations always do. Thank you, dear Erica! I realize that you, too, know very well how wonderful it can be to participate in a dear friend’s wedding. I greatly appreciate you taking joy in my joy; it really means so much to me!